Get the support you need with this body-cushioning layer. Find restful, restorative sleep atop this Comfort Revolution Memory Foam Mattress Topper. With 1.5"-thick foam laid across your mattress, you'll change the look and feel of your bed from a lumpy mine field to an even, level surface. 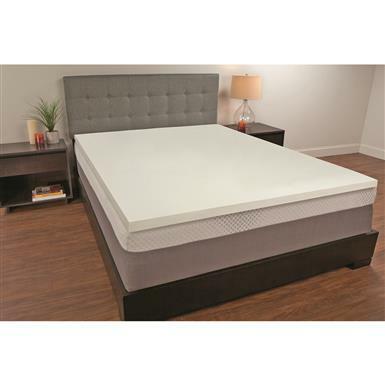 Memory foam actually conforms to and remembers your body shape to eliminate stress on key pressure points. The result is custom comfort that's fine-tuned to deliver a soft, supportive, refreshing night of sleep. Twin measures 39" x 75"l., weighs 9 lbs. Full measures 54" x 75"l., weighs 12 lbs. Queen measures 60" x 80"l., weighs 14 lbs. King measures 76" x 80"l., weighs 17 lbs. California King measures 72" x 84"l., weighs 17 lbs.